If your idea of a superstar tops out at Joe Montana or Michael Jordan, make way for Memo Gracida. The 41-year-old polo player has just finished one of the greatest seasons in the two thousand year history of his sport, is playing at the top of his game, and, in a ceremony without precedent, was inducted into the Polo Hall of Fame while still an active player. As Eric O’Keefe learned, the only aspect to Memo Gracida’s career not being discussed is his retirement. Consider the career of Memo Gracida. He is one of a dozen or so polo players worldwide who have achieved their sport’s mythic ten-goal rating. 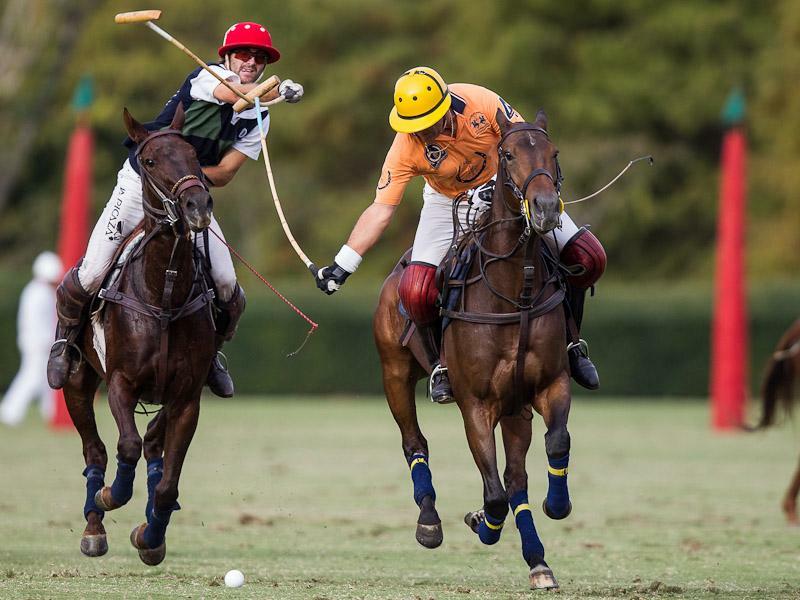 (Keep in mind that on this zero-to-ten scale, less than two percent of all polo players reach five-goal status.) A select band of brothers, ten-goalers inhabit a world well removed from the rest of their sport. Invited to dinners far too discreet for paparazzi, they are regularly feted and continually courted by titans of industry and other polo patrons who retain their services to captain their teams. In Gracida’s case, this has been the norm since 1983, when he first achieved ten-goal status. By his rating alone, Memo Gracida is one of polo’s greats, a fact that is further accentuated by his ten-goal tenure – the longest in the game today. Next, consider Gracida’s 1997 season. The Mexican national-turned-Palm Beach-citizen played in almost every major American and British tournament of note, leading his Isla Carroll foursome to victory in the Gold Cup of the Americas, the World Cup, the Queen’s Cup, and the U.S. Open. For most poloistas, a single championship qualifies a season as a success. For Gracida to lead John Goodman’s Isla Carroll team to four coveted crowns is a tour de force. Clearly, Gracida is first among equals. Finally, consider Gracida’s latest U.S. Open victory. The 10-6 triumph not only gave Gracida championship honors in the most prestigious tournament in American polo, it was his sixth consecutive U.S. Open title and his fifteenth in the last twenty years. The legendary achievements of Michael Jordan, Joe Montana, and Reggie Jackson pale by comparison. Even all-time greats like the New York Yankees in their heyday won four straight World Series at best. Only Bjorn Borg, with his six straight Wimbledon titles, comes close to Gracida’s level of consistency. And Borg burned out before 30. Having just won his fifteenth Open, Gracida, 41, gives no indication of slowing down. Given his exceptional polo playing talents, Memo Gracida would certainly have earned a place for himself as one of the greatest players of his day. (So too would his distinctive yellow polo helmet, a visual aid in any polo match he plays.) But what has enabled Gracida to achieve such an incredible string of victories during the ‘70s, ‘80s, and ‘90s are his talents off the field, “in the barn,” as he is apt to say.At the upper end of almost any team sport – polo included – the players on the field are supported by an even larger off-field contingent that takes care of minutiae from travel arrangements to equipment procurement. In polo, where each four-person team also fields and maintains 30 to 40 horses, these details are the province of the team’s patron, an individual who not only underwrites the expense of fielding a team but actually plays the game himself. This unique aspect of the sport gives polo its patrician air and is best comprehended by imagining, say, Ted Turner suiting out for the Atlanta Braves in a game where George Steinbrenner plays first base for the Yankees. But for most of this century, polo, like tennis and golf, did not condone the use of paid professionals. Patrons typically bought a player’s ponies at the end of the season, an arrangement that justified the relationship but hardly made the players idle rich. This modus operandi lasted until the 1970s when patrons such as Steve Gose and Guy Wildenstein brought their business acumen to the game of kings and set up year-round organizations. This functional change not only affected the way polo was played, it profoundly changed the lives of its best players. “You only had to watch him once to know he was going to be something great.” So begins Steve Gose, the patron who ended Gracida’s university career at Mexico City’s UNAM and brought him to San Antonio, Texas to play for his Retama team in 1977. Gose notes, “Gracida and his father were playing in Houston on the Mexican team that defeated the U.S. in the Camacho Cup [a competition between the two countries that began in 1941]. Gose describes Gracida as bursting with talent and the desire to better himself, a streak that proved problematic. “If it had been up to Memo, he would’ve practiced 24 hours a day and run all my best horses into the ground,” says Gose. But Gose, himself a future Hall of Famer, had found in Gracida someone for whom polo was also more than just a pastime. Before he developed his San Antonio polo center, the Texas oil man had polo fields at his Wichita Falls home. He not only played the game himself, he got his sons to play and he brought Gracida’s brother Carlos up from Mexico to join his team as well. As priorities go, polo rates a close third after family and business for Steve Gose. Though he was no novice to polo, Gracida learned an entirely different game from Gose over the next six years, one that had a businesslike side that almost rivaled the game on the field in importance. Buying green horse and making them into polo ponies was a never-ending process. Bringing in new players, integrating them into an existing team, and improving their skills took months at minimum and years at best. All of this required setting up a year-round staff that included grooms to handle equipment and horses, vets to look after the horses themselves, and players who were paid as professionals to win championships. By the time Gose and Gracida parted in the mid-1980s, Retama had won two United States Polo Association (U.S.P.A.) Gold Cups and four U.S. Opens. Gracida had joined polo’s elite by moving up to ten goals in 1983. And, most importantly, the lessons he learned from Gose were lessons that Gracida would apply to teams that he not only played on, but ran. Gracida left Gose in ’83 and has since gone on to play for some of the best teams in polo including Guy Wildenstein’s Les Diables Bleus, Galen Weston’s Maple Leafs, Glen Holden’s Gehache, Tim Gannon’s Outback Steakhouse, and, most recently, John Goodman’s Isla Carroll. Though he has maintained his ten-goal handicap, in his eyes what has improved most dramatically with each passing year has been his skill at running or, better yet, managing a team. “I remember talking with Hanut Singh [a legendary Indian polo player] about what made the greatest players better, different, the best. Singh said they not only used horses, they rode them. They not only played on a team, they organized them. And their games were not only based on instinct, they had a scientific approach as well. I’ve seen all the great Argentines, and I’ve seen many great Americans. Memo surpasses them all. He is the only one I’ve known who has been able to take over everything – the organization, the logistics – everything. Rather than trying harder, Gracida began to delegate his responsibilities. He brought on a coach to train the team and added a horse trainer soon after. There is a self-serving aspect to Gracida’s system: it allows him to do what he does best – play polo. Above all, Memo Gracida is a polo player in the tradition of his father and five uncles, a six-some who played at the game’s highest level long before that meant any financial payout. There are many reasons for Gracida’s success: his heritage, his work ethic, his timing, his family. But what is striking about each of the people who have played with Gracida for any length of time is their absolute assurance that if he had not played polo, his native intelligence, desire to succeed, and unbelievable work ethic would have made him a success in whatever field he chose.